Poodleism: Twin Peaks - anyone? anyone? Has anyone seen it? It's super weird, but really quirkily hilarious. I can't really explain, but it has strange nuanced humor that I love, but wonder if I'm even getting. Kind of like the first time you watch Napolean Dynamite. You know something funny is happening, but aren't quite sure what. Also, the theme song is infectious, which is why this post is coming to you know, I can't think about anything else. 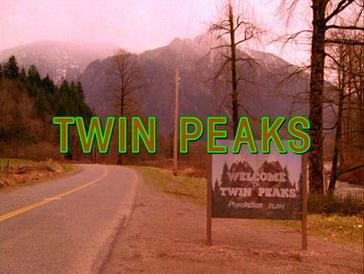 The show is centered around solving a murder in the Pacific northwest town of Twin Peaks. The whole town is involved. There are lots of weird things going on: eye patches, dancing little people, casinos, twisted love affairs, secrets, tape recorders....lots of things. Across the board, it's just a total quirk fest. 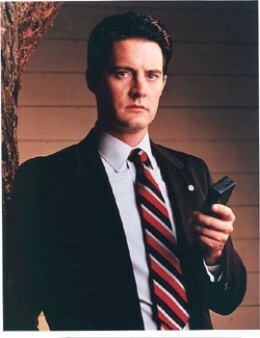 One of the best things is that one of the stars is agent Dale Cooper, played by one Kyle MacLachlan. Recognize? So, have any of you seen it? Anyone have thoughts? It's kind of a weird one, and quite old, but I'd love to hear anyone's feedback. I'm all kinds of mixed up about what's going on. But, please don't spoil the ending, I have 3 more episodes to watch in the first season. I love Twin Peaks! It's like a fun version of The Killing. And Psych did a spoof episode based on it this season, which pretty much solidifies its awesomeness for me. Cause Psych is similarly awesome in all ways, shapes and forms. I love Twin Peaks!!! I just watched the very last episode last night. You'll never be able to fathom just how much weirder it's going to get once you get into the second season. It is soooooo good! I just added the movie, Fire Walk with Me, to my netflix queue, too. David Lynch is a real character and it makes me wonder what is really going on in that crazy head of his.